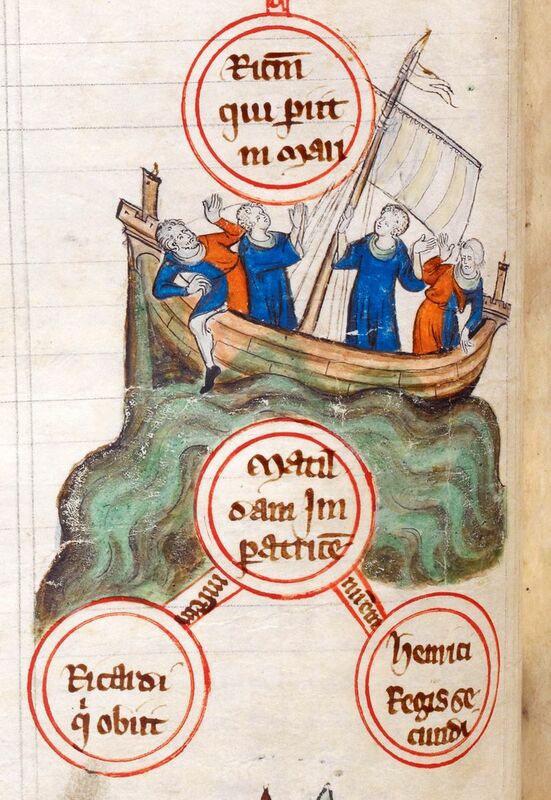 On November 25th, 1120, The White Ship was wrecked in a storm and sank in the English Channel. This terrible accident claimed over 300 lives and turned the course of English medieval history, since one of the victims was William 'the Atheling', seventeen years old and the only legitimate son of King Henry I of England and his queen Matilda, who had died two years before. The White Ship was a modern vessel, a sturdy cog owned by Thomas FitzStephen, who was also on board, but the channel crossing from Normandy to England is treacherous, especially in winter. Henry's ship had already left Barfleur, on the north-western coast of France, in daylight, but when Fitzstephen's ship eventually sailed, after being loaded with more casks of wine, it was night. Worse, everyone on the ship was drunk. The ship struck a rock off Barfleur off the coast of north-western France and was wrecked. Only a butcher called Berthold from Rouen, on board to chase up payment, survived because the ramskins he was wearing saved him from exposure. Prince William and many of his friends, all young nobles, were drowned. Chroniclers of the time said that Thomas FitzStephen, knowing that Prince William was lost, allowed himself to drown rather than face King Henry. At court, none of the barons dare tell the king. A child was finally sent with the terrible news. Henry fainted and afterwards was said never to smile again. Henry, stricken with grief, also afraid for his crown. His other legitimate child, named Matilda like her mother, was a daughter and in the Middle Ages women were not thought capable of ruling without male help. The traditional role of a queen was as a help-meet of the king and an intermediary for petitioners seeking mercy from the king. She was not expected to rule alone. Aware of this, King Henry married again within 3 months of the sinking of the White Ship and the loss of his male heir, but had no further legitimate children. Henry was terrified of the prospect of no obvious male succession to the English crown, won by his father William of Normandy at the battle of 1066 - the more so perhaps because he owed his own title of king to an 'accident' in the New Forest in August 1100 when his older brother, William Rufus, the King of England, was killed by an arrow while out hunting. Accident or assassination? It is still unclear but the younger brother, landless Henry, wasted no time in seizing the royal treasury and securing his position. The death of William Rufus had favored him but the sinking of The White Ship threw his dynastic aims into turmoil. He attempted to extract promises of loyalty from his barons to his daughter Matilda, but some of the barons favored Henry's favorite nephew Stephen and when King Henry died in 1135, Stephen was crowned king of England in his place. Matilda and her supporters saw this as a betrayal and both factions fought for their claims over England for over 20 years, a conflict which forms the backdrop for my novel A Knight’s Vow, set in 1138. Had William not been traveling on The White Ship all those years ago in 1120, if he had lived and succeeded his father, England would have seen a different line of Kings - Anglo-Normans instead of the later Angevins. No Henry II and Eleanor of Aquitaine, no Richard the Lionheart, no King John - all descended from Matilda's marriage to Geoffrey of Anjou.